NICE Paintings lists the 1679 work as by Egide Smeyers (Flemish painter, 1634–1710). According to collection records 'A Connoisseur’s Studio' was painted by Jacobus Smeyes. Magdalena Lanuszka posted that Getty ULAN lists Jacques Smeyers (Flemish artist, 1657–1732), also called Jacob Smeyers. Apparently this artist was son of Egide Smeyers (1634–1710) and tthe father of Egide Joseph Smeyers (1694–1774). St Edmundsbury Museums looked at the inscription on the painting itself and deciphered the word 'Smeyes' and the date 1679: the word preceding Smeyes appeared to be Jacob or Jacobus. 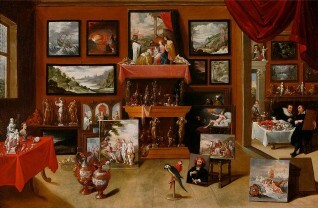 Andrew Greg found that the painting appeared to be a copy of Frans Francken II’s 'A Collector's Cabinet' of c.1610-1615. 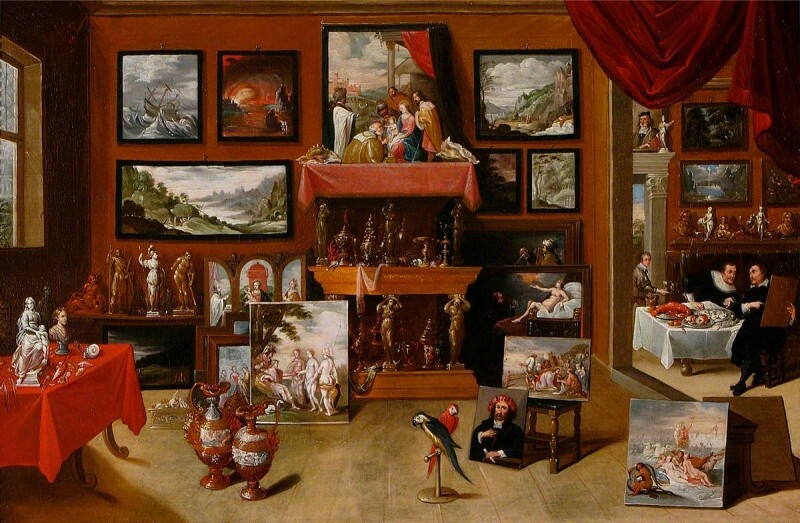 The collection confirmed that the record is to be listed as (given title) 'A Connoisseur's Studio' by Jacobus Smeyes or Jacques Smeyers (1657–1732), with a description noting the connection to the Frans Francken II work. Who painted 'A Connoisseur's Studio': Egide Smeyers, or Jacobus Smeyes?